Though empanadas are most often thought of as savory pies, they can also be made of fruits and served as a dessert or for merienda (teatime). 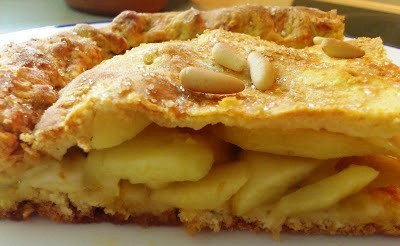 For the best results, I recommend using tart, slightly acidic apples for this recipes. The dough for most empanadas is made with wheat flour; for desert empanadas, I find that corn flour works better. To simplify your shopping, I have userd wheat flour here, but if you decide to try corn flour, use the same amount. To make the dough, in a large bowl, whisk together the egg, sugar, and salt until blended. In a small bowl, dissolve the yeast in the warm milk and let stand for about 5 minutes, or until foamy. Add the yeast mixture and the butter to the bowl with the egg mixture and mix well. Add about half of the flour and mix with a rubber spatula or wooden spoon until completely incorporated. Add the rest of the flour a little at a time, continuing to mix with the spatula. When all the flour has been added and the dough becomes difficult to mix, turn the dough out onto a lightly floured work surface and knead until well blended and elastic but not sticky, about 10 minutes. Place the dough in a large bowl, cover with a damp kitchen towel, and let rise at room temperature for about 1 1/2 hours, or until about doubled in size. Preheat the oven to 450ºF. Brush a 10 by 15-inch baking sheet or an 11-inch pie pan with olive oil. Lightly flour the work surface. Punch down the dough and divide into 2 pieces, one slightly larger than the other (the larger portion will form the bottom crust, and the smaller portion the top crust). Using a rolling pin, roll out the larger portion into a sheet about 1/4 inch thick and slightly larger than the baking sheet or pie pan. Transfer the dough to the prepared pan. Using your fingers, press the dough over the bottom and up the sides of the pan. Pierce the dough with fork tines in several places to prevent bubbles from forming. Layer the apple slices neatly and evenly over the dough. Sprinkle the apples evenly with the sugar and then brush with the apricot jam, if desired. Roll out the second portion of dough into a thin sheet slightly smaller than the bottom crust. Carefully lay it over the filling. Trim any raggedy edges. Using your fingers, press the edges of the top and bottom crusts together, sealing them securely. Trim off any excess dough. Pierce the top of the dough several times with the fork tines to allow steam to be released during baking. Brush the top with the beaten egg. Brush the top with the beaten egg. Place the empanada in the oven for 30 minutes, or until nicely browned. Transfer to a wire rack and let cool in the pan. Serve warm or at room temperature, cut into squares or wedges. 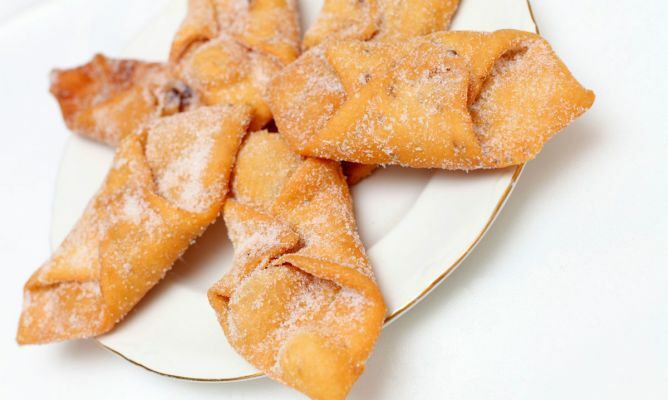 Pestiños (Sweet fritters): No seas pestiño means "don't get on my nerves". But while making pestiños is not nerve-racking, you do need to pay attention when both mixing and frying. These crunchy fritters are popular in Andalusia, where cooks fry with passion.